The Plains and Midwest of the U.S. were hit hard by an ice storm earlier this week. The storm left a glaze of ice up to 1 ½ inches (approximately 3.8 cm) thick. 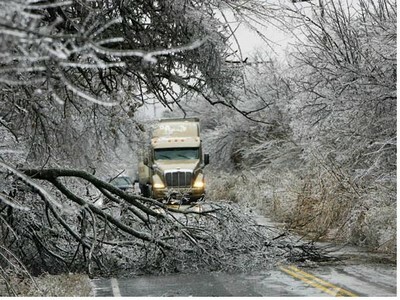 Many trees and power lines were downed by the ice. Streets were impassable and power outages were widespread. At worst part of the storm, approximately one million (1,000,000) homes and businesses were without power. Fortunately, warmer weather has come and the ice is melting. To those of you who have been hit by the storm, I hope that you get your power back and that the downed trees and tree limbs will be removed soon. For others, be thankful that the ice storm didn’t affect you. For everyone, have a warm and bright holiday season.